Thailand is well known as a country to bag a bargain. The markets of Bangkok are a fascinating and exciting experience, where you can wander through the maze of stalls and take in the sights, sounds and smells of the city. If you are planning to fly to Bangkok, then schedule in plenty of time for shopping. Chatuchak Weekend Market is a must visit, while others such as those in Patpong and Khlong Thom offer exciting night-time shopping experiences. For gifts you won’t find anywhere else, try one of the unique floating markets. Chatuchak Weekend Market is enormous and will challenge even the most seasoned shoppers. It is home to more than 8000 market stalls and you can expect it to be exciting and bustling as more than 20,000 visitors descend on the market to buy just about everything. To help you navigate your way through the maze there is a number system. Alleyways are labelled and the market is grouped into 27 sections. This can be a huge help when you want to remember a stall when shopping around and comparing prices. Chatuchak sells pretty much anything you could ever want…ceramic pots, spices, shoes, lamps, jeans, paintings to name but a few, so you are bound to return with a stack of goods. Pratunam clothes market is the best clothes and textile market in Thailand. Standing opposite the giant Baiyoke Tower, you will find a labyrinth of alleyways with clothes hanging all around the narrow lanes. You can pick up bargains that are being sold for much more in the department stores, but sizing is Thai rather different than western so it might not be easy to get the right fit. 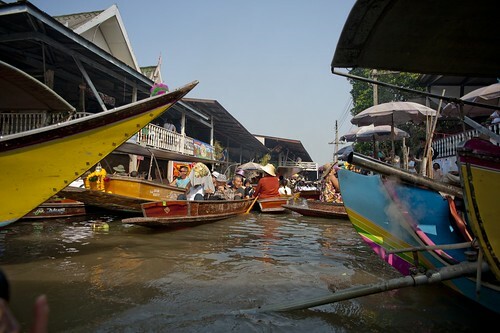 Bangkok had many floating markets because of the easy access of water transport, but due to development many of the waterways have disappeared. Two of the main floating markets still worth visiting are Damnoen Saduak and Amphawa market. Both are within two hours of the city and can easily be accessed on an organised trip or independently. It is a memorable experience to buy goods from a boat while you walk along the banks of a river. Asiatique combines a night bazaar with a shopping mall. This busy complex has been created around a restored pier in what was once a bustling international trade port. It has now been developed to hold over 1500 boutiques and 40 restaurants as well as offering entertainment. It’s easier and much faster to arrive by boat as traffic can be hectic in the district. Most of the shopping is in large open buildings that have been designed to replicate enormous warehouses. It may be a little over the top, but as you will find a mixture of locals and tourists there it doesn’t feel too much like a tourist attraction. 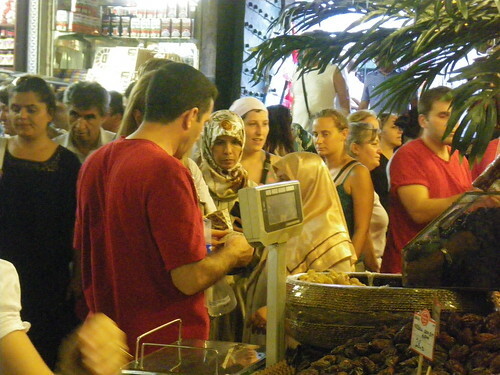 Smile and be friendly when haggling; it’s likely to get you further. Wear comfortable shoes – you’ll be on your feet shopping for a long time. Travel to Bangkok with a half empty case so that you have room for your purchases. Check your goods thoroughly before purchasing to make sure there is no damage, especially with furniture and antiques. Don’t assume that anything in the market is genuine. Make a list of things you’re looking for before you hit the shops. Just be prepared to be lured into buying more than you bargained for! Take a bottle of water as it can get hot while you’re shopping. Protect yourself from the sun with sunscreen, a hat and sunglasses. Bring your own backpack with you to carry your purchases, although it is recommended that you either wear this on your front or you lock it so that it is kept secure. Don’t assume everything for sale in the market is being sold at a good price. You still need to do your research. Bring cash as many vendors don’t accept cards, although don’t store a large quantity of cash in one place on your person. Don’t take valuables with you like laptops or expensive cameras while out shopping. Go early and get your shopping out of the way before the crowds descend, or go late when it is cooler. Pick up a free map if one is available so you can mark where you see stalls you’d like to go back to when you’ve figured out what price is best. If you want to buy a number of items from one seller then you can usually get a special price. Thailand has so many markets to explore. Whether you are looking for high end shopping malls or traditional bazaars, Bangkok is a fantastic shopping destination. Editors Note: Today’s article was written and brought to you by Karen Bleakley. Karen enjoys travel in South East Asia and especially Bangkok’s many markets and shopping malls. Photo Credit: Floating Market courtesy of flickr user jscoke via a creative commons license. Are souvenirs the best memories? I’ll admit it, I am a recovering market-a-holic. You set me free in a market somewhere in the developing world and a shopaholic previously unknown takes over my body and I’m like the hulk. I’m instantly feeling like a millionaire as I look through baskets of earrings, bangles and scarves for friends and family at home. And then I’m confronted with something else, something not made in China, something not mass produced and the traveler in me instantly thinks a-ha! This is it, this is the souvenir I want to take home. This will be an item I will always cherish and will always remind me of my trip to ____________. Two stalls down I purchased 10 pairs of earrings for $.20 each. I gave them away to my friends and they turned their earlobes green. Years later, even as it becomes harder and harder to remember where that item was purchased I look at it and I am transported back to the market or vendor’s stall. I look at the drum we purchased in Cairo at the Khan el–Khalili market and I’m reminded of sitting in a stall full of onyx down the street, debating for what seemed like ever on which items to choose, only to have many of them broken in transfer back home. “I package it well, I swear will not break madam,” I can still hear the vendor say. The drum is covered in abalone laid out in a geometric pattern. “Genuine mother of pearl,” the vendor said. I can still taste his sweet tea on my tongue, still remember the German couple that came in and proceeded to negotiate hard for small trinkets as we stood steadfast in our price for the drum. I remember how we walked out when we didn’t get our price and how upon a moment of reflection, the salesman came after us. I look at the drum and I remember. The drum in question. Yes, that is “genuine” mother of pearl. Are souvenirs the best memories from a trip? Perhaps, if only because they bring us back to a time, a place and a moment which we would otherwise forget. The object itself might be junk (what did you expect for $1 genuine mother of pearl earrings? ), but the memories it holds are priceless. You never know what you’ll come across in a market. These colorful glass soda or seltzer bottles stood out from the knick knacks and antiques in Buenos Aires’ San Telmo market. A collection of bric a brac and items hauled from grandma’s closet, with some interesting crafts (a zebra T-shirt? ), plenty of cheap ‘made in china’ stuff and artisans thrown in, the market is a delight for your senses. The overcrowded market does have some more interesting booths, especially for those of us not interested in antiques. When we were there several jewlery artists lined the road, each with a uniquely designed collection made of unusual materials- bone, silverware, shells. I’m a bit of a market jewlery junkie, so it was hard for me to break away! IF YOU GO: Although crowded, Sunday is the best day for the market and if you’re looking you’ll find something unique. Watch your pockets and dress comfortably– its easy to spend hours walking down the side streets. We were surprised by the number of immigrant artisans on the streets- a unique collection of people from all over the world, from africa, asia and europe. I wonder if you’d see those same crafts in Senegal or on a malta holidays? There was something sad about the flea markets in Tbilisi. Hundreds of makeshift stalls lined the streets, often just a person with a folding table or blanket on the ground. It was different than any other flea market, there was a sense of resignation in the air. Many of the vendors were old women selling off what appeared to be whatever was left of their valuables and some of the collections had an air of sadness about them. Many of Georgia’s elderly are in difficult financial situations, having lived their high earning years under communism. Not that there weren’t art dealers, jewelers and even coin collectors in the mix. This photograph was taken near the front of the market where a 30 something year old man had set up shop. A camera collector, he was selling off his collection bit by bit. We spoke with him at length about his collection and it was clear from the first words out of his mouth he loved these machines. In the end we bought a pre-WWII camera from him, complete with glass slides instead of film!